Bone Collection Ninja Flash Drive – Is That A USB Port In Your Pants Or Are You Just Happy To Store Files? | OhGizmo! Bone Collection Ninja Flash Drive – Is That A USB Port In Your Pants Or Are You Just Happy To Store Files? Anyways, on the plus side there’s also a set of magnets in the ninja’s feet that let him scale filing cabinets and fridges, and he’s available from Cyberguys, in black or red, for $24.99. 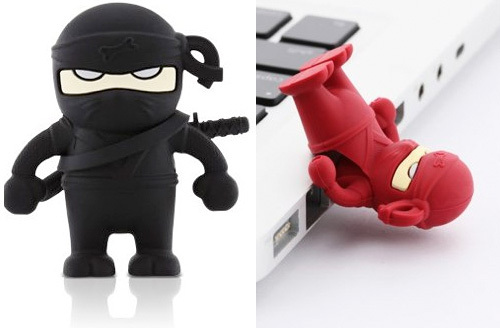 But the photo when you plug in your usb…it looks like the ninja is poopoo on your notebook.